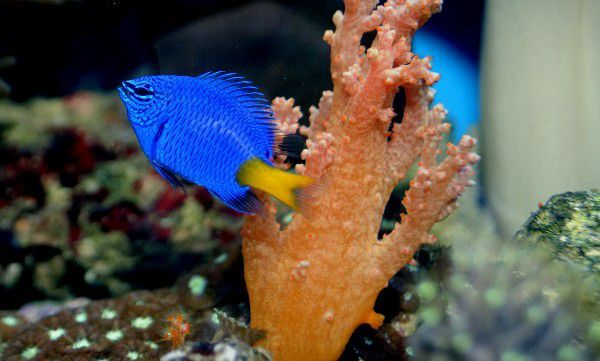 The Yellow Tail Damselfish (Chrysiptera parasema) is a very popular fish for a saltwater aquarium. Among Damsels, the Yellow Tail Damsel is one of the more docile and gets along with most other fish in an aquarium. The Four Stripe Damselfish (Dascyllus melanurus) also known as Blacktail Dascyllus, Blacktail Damselfish, or Blacktail Humbug, is a popular fish in spite of its somewhat aggressive nature. The Hawaiian Dascyllus (Dascyllus albisella is also known as the Domino Damsel is endemic to Hawaii and is also one of the meanest, most territorial damsels in the ocean. This fish will dominate any aquarium it is in, no matter who its tank mates are. The Blue Green Chromis (Chromis viridis) is one of the most preferred fish for a saltwater aquarium. This beautiful fish is reef tank safe and gets along with everything in a marine aquarium. The Blue Green Chromis is a great beginner fish. This fish grows to a maximum size of 3 1/2". The Acapulco Gregory (Stegastes acapulcoensis) juveniles are a beautiful electric blue in color, but as they grow to an adult, they change to a muted beige color. In the wild, this fish Inhabits rocky reefs from Mexico to Peru and attains a length of 7 inches. The Agile Chromis (Chromis agilis) is common in small aggregations at scuba depths. It feeds upon zooplankton and attains 4 inches in length. It is golden brown with a pink or blue cast and a black spot at the pectoral fin base. It is found in the Indo-Pacific area including Hawaii. The Blackfin Chromis (Chromis vanderbilti) is common in aggregations feeding upon zooplankton just above the reef at scuba depths. It attains 2.5 inches in length. The lower lobe of the caudal fin of this fish is always black. It can be found from Japan through Oceania and Hawaii. The Blacksmith Chromis (Chromis punctipinnis) is abundant in kelp the forests of Southern California and attains a length of up to 7 inches. The Blackspot Chromis (Chromis atripectoralis) is fairly common among branching coral in shallow water. The Blackspot Chromis has a dark spot at the base of its pectoral fin and attains a length of about 4.5 inches. It can be found from Seychelles to Okinawa and Tahiti, except Hawaii. The Blue Chromis (Chromis cyanea) is common in aggregations high above the reef feeding on zooplankton from Bermuda south to the Caribbean. It attains a length of about 5 inches. The Blueeye Damselfish (Plectroglyphidodon johnstonianus) is a solitary inhabitant of large Pocillopora corals. It is olive green, darker at the rear, with neon blue fin edges and eyes. It feeds upon coral polyps and attains 4 inches in length. This fish can be found in the Indo-Pacific including Hawaii. The Indo-Pacific coloration variation is yellow with a diffuse black bar at the rear. The Chocolate-Dip Chromis (Chromis hanui) is endemic to Hawaii, however several related species can be found throughout the Indo-Pacific region. It is common on reefs at scuba depths, feeding upon zooplankton. It attains a length of 3 inches. The Dusky Gregory (Stegastes nigricans) inhabits Acropora thickets in lagoons. It is an aggressive species, attaining a length of 6 inches. It can be found in the Indo-Pacific except for Hawaii. The Garibaldi (Hypsypops rubicunda) is common in kelp forests of Southern California and the Pacific coast of the Baja peninsula. It attains a length of up to 12 inches. This is the state fish of California and is illegal to capture or sell. The Hawaiian Gregory (Stegastes marginatus) is endemic to Hawaii. It is a very common solitary inhabitant of shallow reefs. It has yellow eyes and attains a length of about 5 inches. The Hawaiian Gregory maintains a crop of algae as food and vigorously defends it home 'turf' from surgeonfishes and other damselfishes. Juveniles have neon blue fin margins and yellow peduncle. It was recently separated from Stegastes fasciolatus of the Tropical Pacific.